I looked around the official support post for TP and I couldn't find any info on this. Most of the game is working flawlessly for me, though I have noticed that I'm having trouble getting my minimap to appear correctly. Before anyone assumes it's just another case of enabling EFB RAM, I already had and solved that problem. The bug I'm experiencing makes the minimap have a border slightly beyond the edges of the map shifting from red to blue, which is both an eyesore and distracting. There seems to be a layer of shaders or something missing around the map. In addition, the map is very low-res. The rest of the game looks very high-quality and sharp (especially the characters *drools*), but the map GUI is pixelated and blurry. The button UI in the upper-right does not suffer from a loss of resolution, so why is the map? I'm running Windows 7 64 bit, 64 bit Dolphin 4.0. Computer is brand-new, and specs are in my sig. Any suggestions are welcomed, thanks! I have a question that's unrelated to your problem, but out of curiosity, someone said that the AMD FX is actually slower than the Phenom II clock by clock. What I want to know is if this is true or not? Oh and what chipset is your MSI Twin Frozr? It seems to be a setup issue; make sure you don't have any weird hacks on or anything. If you'd post your settings, especially in graphics, I'd be able to assist your more readily. drhycodan Wrote: I have a question that's unrelated to your problem, but out of curiosity, someone said that the AMD FX is actually slower than the Phenom II clock by clock. What I want to know is if this is true or not? Oh and what chipset is your MSI Twin Frozr? ....why the bloody hell would you ask that here? A first time poster asking for help with an issue and you bring up something he'd have no idea about while NOT helping him? Sheesh. Ask this in the Hardware Discussion Thread. Well, I basically decided to reset every graphics setting I had to the default "If unsure, leave as ___" values. 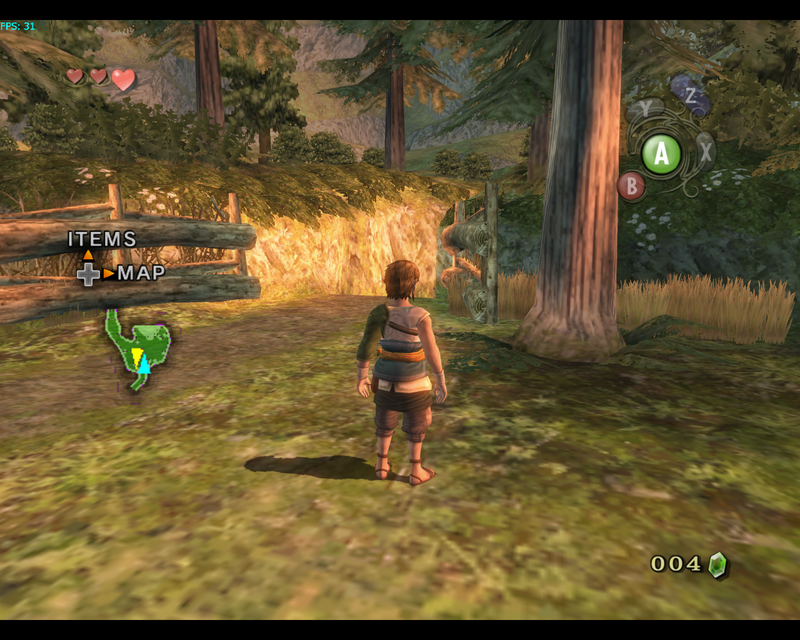 From there, I was able to get to get it to be playable, but not particularly stunning graphics. Enhancements tab: Internal resolution- 3x native (1920x1584) ; Anti-Aliasing- none ; Antistropic filtering - 1x ; Scaled EFB copy enabled, per-pixel lighting enabled. I really REALLY hope this is the info you were looking for, JMC. Any increases in antistropic filtering glitch the map like earlier, and even the smallest increase in AA result in a small amount of glitching on the map: http://i.imgur.com/9heKr7V.png . I really want to be able to push the graphics further than this. Would it help to switch to a different backend or something? I vaguely recall the minimap being bugged if the EFB settings aren't set up right. Though this was with an older Dolphin version and it's been awhile since I played TP on it. Do you have "Skip EFB access from CPU" enabled? What is your "EFB Copies" section set to? Make sure it's not disabled and uncheck the "Skip EFB Access from CPU" setting if it's checked. Ok I fired up TP and noticed the very same issue you have. I toggled various settings until I found the culprit. The "External Frame Buffer" section must be set to "Real" and NOT "Virtual". After I set it to Real, most of the minimap glitches went away. Though there was a black line at the bottom but is very minor and doesn't obstruct anything. Perhaps would go away if I used native resolution instead of running it at a higher resolution. You might see an overall drop in the quality of the UI though if you are running at a high resolution and have the External Frame Buffer set to Real. But this seems unavoidable if you want the minimap to look correct. Enabling EFB and setting it to real made dolphin freeze trying to open up the game. I bypassed this using a savestate, checked the map, and nothing had changed from earlier. I did notice a pattern, though! The outline appears when I raise the anistropic filtering above 1x or if I enable "Force texture filtering", and the strange dots on the map appear when the Anti-Aliasing is enabled. The game is still pretty playable with the anti-aliasing dots, I eventually tuned it out of my mind and didn't notice they were there. Antistropic filtering would be nice, but oh well. Ummm, you shouldn't need to set External Frame Buffer to Real; I'm pretty sure that's unnecessary. 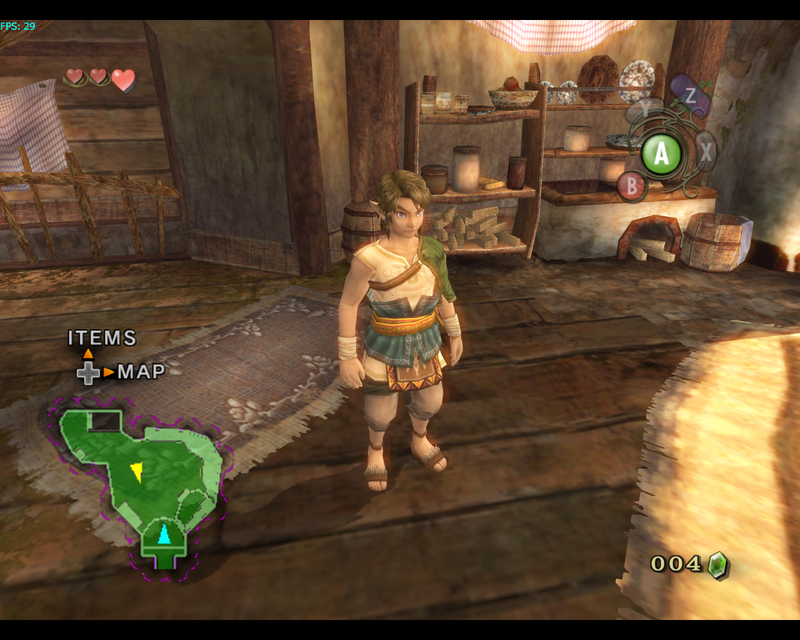 I also have this same issue, but I am playing the Wii version of TP, and it looks like this is the GC version (based on the GC controller buttons in the upper right in the pics). Hopefully I'll have some time later tonight or tomorrow to mess around w/ the settings and find a fix. If I happen to stumble upon it, I will update the thread. Crap, did I never specify that this is on GC? It's on GC.